The Swift RS’s body kit includes a revised front and rear bumper and a roof spoiler. It also gets black and blue body graphics, along with black wheel covers. The wing mirrors come in blue and there’s even an illuminated Swift emblem on all four door sills. On inside, the car comes with blue and black interiors with updated music system which is Bluetooth, aux and USB enabled. Said Manohar Bhat, VP-marketing, Maruti Suzuki India, "The Swift RS is in continuation of Maruti Suzuki's celebrations planned around Swift model as it moves towards the 1 million cumulative sales mark. Swift has cumulatively sold over 9.6 lakh units since its launch in May 2005. The limited edition Swift RS will be ideal for customers who look to further enhance the sporty character and style of the Swift. All this comes with a much higher value worth than the price customer pays for Swift RS package." The Swift RS comes with new styling and graphics for a sporty look. The Swift RS will be available only in limited numbers and for a short period, the company has announced. 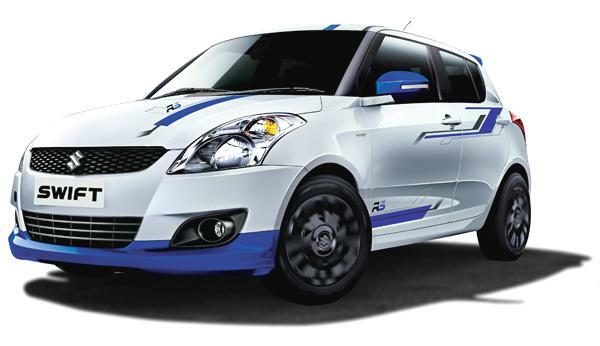 The Swift RS enhancement package is priced at Rs 24,500. The limited edition variant will be available in VXi (Petrol) and VDi (Diesel) variants at Maruti Suzuki dealerships across the country from early July 2013, for a limited period.